The flurry of announcements from the FIA regarding future rule changes is quite interesting beyond the bare proposals included. Budget capping is to be introduced from 2009 and the engine freeze will now be for five years, rather than ten. 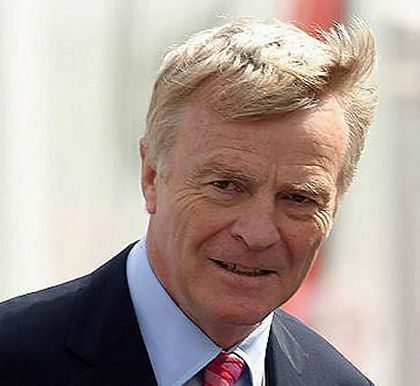 PitPass reckons this is a triumph for Max Mosley's negotiating skills but I wonder; to me, it looks more of a climbdown. The ten year freeze that Max was so adamant about a month ago is now halved and has the promise of a completely new engine formula tacked on to it. This will introduce stringent energy-saving goals and encourage the use of alternative sources of power. Is it purely a coincidence that this change came about after the EU started making noises about F1's profligate use of energy and production of emissions? Far more likely is that Max did not think very carefully before coming up with the ten year scheme and has now realized what a bad idea it was. And was it also by chance that the first to mention the possibility of budget capping rather than wind tunnel and computer design limitations was Ross Brawn? Both suggestions cannot be policed effectively but at least budget capping allows the competitor some degree of freedom in that he decides where to spend his money. So Brawn's idea was obviously preferable to Mosley's and the teams (with the exception of Ferrari) have supported the lesser of two evils - and Max has backed down. He still waves his wind tunnel limitations as encouragement to agree to the budget capping, however. It seems the man can get nothing done without threats and blackmail. Is this because the F1 teams are so intransigent that the heavy hand of compulsion is necessary to get them to agree to anything, or is it because that is the way Max likes to do business? Generally speaking and with Ferrari being the odd man out, the teams have proved themselves able to reach a compromise between themselves. Let us not forget that the ten year freeze resulted from Max's fury that the manufacturers rejected his original suggestions and presented proposals of their own. That to me looks like a willingness to compromise on the behalf of the teams and a refusal to bend on the part of Max. It is stated often that Max tends to produce extreme proposals in the knowledge that the teams will be so horrified that they accept anything less drastic. That may sound like a clever way to go about things but it shows just how much power is vested in the hands of one man. As ably demonstrated last year, Max is able to do whatever he wants and there seems no way of curbing his excesses. Unless the EU takes an interest. I'll give Max his due - he knows when he is up against an opponent too big for him. The abandonment of the ten year freeze was the quickest U-turn I've seen in a long time (and a model of press manipulation in making it seem that it was his idea all along). Is this really the way the sport should be governed? When rule changes are not serious items for discussion but bargaining counters only, when political scheming becomes the order of the day, when insults become the answers to any reasoned criticism, who can know where the sport is heading? For how long will the manufacturers be prepared to participate in a sport where nothing is certain and every year they are told that they must now jump through different hoops (while not spending too much money)? I can remember back in the early eighties when the teams began to complain at the frequency of rule changes. They had just emerged from the seventies, a time of unchanging stability in the regulations, and the idea of rules being altered must have seemed anathema. There is some irony in that the original intention of the Concorde Agreement set up at the time was to ensure proper notice of any rule changes and to limit the frequency of their introduction. It was a world in which F1 went carefully about its business, not making hasty adjustments but considering all aspects of a problem before suggesting solutions. Whatever happened in the intervening years? How did things come to this pass, where the FIA president can invent rules and regulations at the drop of a hat and threaten dire retribution if anyone disagrees with him? Something needs to be done about the way the FIA operates or the sport will become unrecognizable in the next few years. The idea of introducing an energy-saving formula is good; to anyone with a modicum of awareness, this was always going to be the way forward. It is the way in which the FIA have finally got around to proposing it that worries me. Judging by the convoluted path taken before reaching the obvious conclusion, we can have no confidence in the final results from the studies to be conducted. After all, if Max doesn't like the conclusions, he can just rip them up and insist the teams run on jelly beans. When i read an interview in the FIA website, i had no option but to unfortunately agree with some of Max's views. Remember, the proposals for 1,5 litre turbo diesels that were put together when the GPMA and FIA kissed and made up? Max was loosely referring to those proposals and that some manufacturers have already began working on those engine developments since the engine department now was relatively less challenged. And in that reply he sort of sounded like the 10 year freeze was an unrealistic, temporary gimmick to stop the lunatics from burning money before something was put on paper. He sounded like a man who knew what he was doing and i always suspected that the 10 year freeze will be repealed. If thats what is needed to stop F1 teams to stop working on their own interests and look at the bigger picture, then it does look like a shrewd move. Coming to the issue of budget capping and one engine change per season, i think those radical wind tunnel and CFD restriction proposals that max threw at the manufacturers (and still threatens to implement if they dont get in line), were only a bargaining tool and all of us knew that it was never gonna happen. The budget caps and the windtunnel/CFD restrictions are equally unenforceable. Either way, Max will eventually lose because some teams will find ways around them (accidentally or on purpose). In the light of that, the engine reduction is a weakening of Max's political position - though I doubt Max sees it that way at this time. Indeed, the EU were implicitly criticising the concept of an engine freeze and are unlikely to be satisfied with a mere reduction. You are quite right about my attitude towards Max hardening over time, Uppili. When I first started blogging about F1, I was quite prepared to accept what Max and the FIA produced as genuine efforts to improve the sport, if often misguided. But I have found it impossible to retain that stance as Max introduces one crisis into F1 after another. It seems that he never allows the printers of the regulations a rest and is constantly throwing out wild suggestions of what the sport will become. I am tired of the man and wish that he would go. Even so, I think you will find that my article admits the possibility that Max has achieved what he wanted all along through clever manipulation and deviousness. It is the method that sticks in my craw, not the final result. To me, the way he conducts business is unnecessarily deceptive and dishonest; a man that devious cannot be trusted and I would far rather that the FIA was run by a man who says what he means and means what he says. Damon Hill has been suggested as a replacement for Max - and he is exactly the straight kinda guy I'm talking about. Away with the lawyers! As usual, I agree completely, Alianora. But, if Max induces a situation where the EU dictates to the FIA the future for F1, he will have done the sport a disservice from which it may never recover. Jelly Beans for fuel? Distilling the sugar could produce methanol (combustable fuel) and is an exothermic reaction which gives off heat. If we capture the water vapor in the exhaust and reheat the water using the distiller, the water to steam, driving a turbine........I think I've got a Hybrid F1 in the making. THANKS for the inspiration, Clive. Wait 'til MadMax hears about this! 10 year freeze, GONE; 5 year freeze, GONE; New regs on the way!